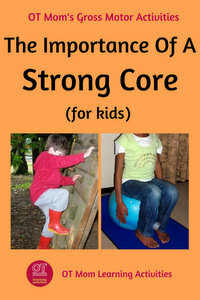 Having good upper body strength can help support your child's fine motor skills development. Read on to find out more! 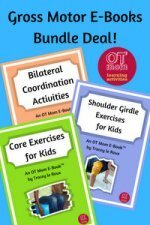 Does my child have poor shoulder girdle stability? 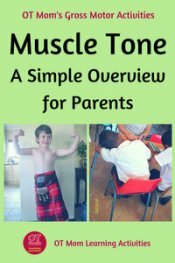 How can I help my child develop upper body strength? 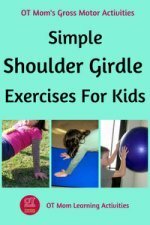 Many upper body exercises for kids work on improving the strength and stability of the shoulder girdle muscles. Therapists often talk about needing proximal stability for distal mobility. This means that the large joints close to the body need to be stable, in order to provide a stable base for accurate movement at the joints further away from the body, such as the hand and fingers. The large muscles of the shoulder girdle are the pectorals in front and the trapezius and rhomboidus muscles at the back. When these muscles work effectively together, they stabilise the shoulder girdle and make it possible for the smaller muscles in the hand and arm to do their job effectively. Good upper body strength and shoulder girdle stability will help your child to cut with scissors and to write without getting tired or producing messy work. 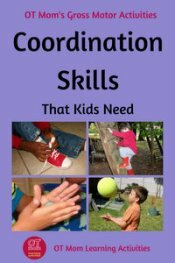 Other fine motor tasks such as craft work, tying shoelaces etc are also much easier to carry out when the shoulder girdle muscles give good stability. Does My Child Have Poor Shoulder Stability? 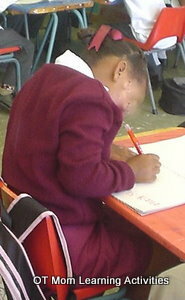 Can you see the shoulder move as your child colors, draws or writes? 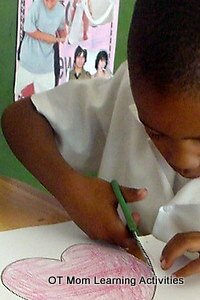 Does your child use whole arm movements when coloring or drawing (instead of hand and finger movements)? 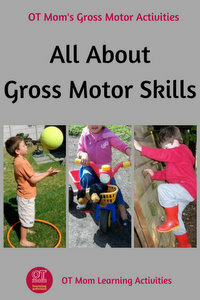 Does your child tire easily during fine motor tasks? 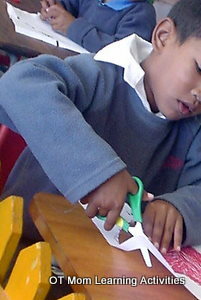 Does your child tense up the neck and shoulders when attempting to cut with scissors, draw/write or use a knife and fork? The children below are displaying tension at their shoulders and movement at their shoulders while they are doing a fine motor task. Although young children attempting a task for the first time may hold their arms awkwardly or in an exaggerated way, they should soon relax as they become more accomplished. 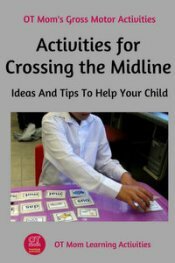 But if your kindergarten or grade school child approaches every fine motor task with tension in the shoulders and tiring easily, then you may have reason to be concerned. An assessment by a pediatric physical therapist or occupational therapist can help to identify and treat the underlying cause of the poor shoulder girdle stability, which may be low muscle tone, developmental delay, or a genetic disorder among other things. Probably the first, and hardest step, is to simply help your child get more active! 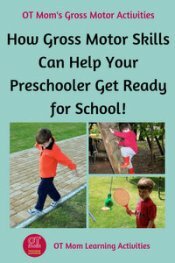 See how you can incorporate more gross motor games and sports in your child's life. Try and get a park date in once a week, and see if you can go swimming, which is great for all-over body strengthening. Look for activities and games that involve pushing, pulling, clambering and crawling. Obstacle courses are great for these! 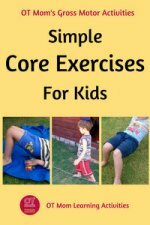 But sometimes kids need encouragement to work specifically on upper body and core strength, particularly if they have struggled with these activities in the past. Here are some pages on my website that offer you photographed ideas that you can easily implement at home... have fun! These activities are offered to promote your child's normal development. They are NOT a substitute for occupational therapy assessment and treatment.